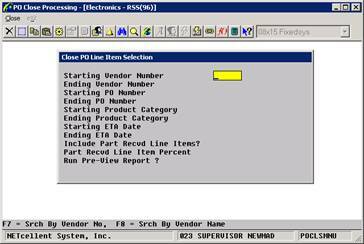 The P/O Close Processing allows you to close a line item on a purchase order or the entire purchase order. Before Elliott V7.4 you could flag the PO as closed, however nothing really happened until you purged the closed PO. Still, the quantity on order and ATP details would appear in the system. Since most Elliott users were reluctant to purge the closed PO, the PO close process was not very functional. (1) You can now close a PO at the individual line item level. This gives you a lot of flexibility since the entire PO does not have to be closed. In addition, when a PO Line Item is closed the Quantity on Order and ATP details will be reflected in real-time, even though the closed PO Line Item has not been purged. Flexibility extends further by allowing the user to unclose the line item if closing was a mistake, restoring the line item back to its original state without any consequences. This function will give you much more control over the PO quantity in advance when the goods are on the ocean. As discussed previously with the new ATP, when goods are on the ocean you can input (or import) the receiving transactions and put them on hold. This will result in the pending receiving showing up in ATP to help customer service identify the goods on the ocean. This can assist you with making the decision of whether the balance quantity on a PO should be closed or not. You may close a PO line item even though there are receiving transactions for that PO line item. (2) A new batch utility allows users to close the PO Line Items based on certain selection criteria. For example, you may choose to close all PO Line Items that are over three months past due. You can run a pre-view report to verify the line items before you commit to closing PO Line Items in mass. (3) Similarly, a batch utility has been introduced to allow the user to close the entire PO based on certain selection criteria. Enter a valid vendor number of the first vendor whose line items are to be included among those that are to be closed. 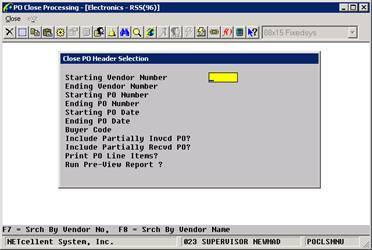 Press the F7 key to search by vendor number. Press the F8 key to search by vendor name. Enter a valid vendor number of the last vendor whose line items are to be included among those that are to be closed. Defaults to the starting vendor number. 6 numeric digits followed by 2 numeric digits (999999‑99). Enter the purchase order number of the first purchase order that is to be included among those con­sidered for closure. Enter the 6‑digit purchase order number followed by the 2‑digit release number. Enter the purchase order number of the last purchase order that is to be included among those considered for closure. Defaults to the starting number's value. Enter the beginning product category of the line items that are to be included among those that are to be closed. Enter the ending product category of the line items that are to be included among those that are to be closed. This field is skipped if all product categories are selected. Enter the earliest ETA date that will qualify a line item to be included among those considered to be closed. Enter the latest ETA date that will qualify a line item to be included among those considered to be closed. Include Part Recvd Line Items? Answer Y if you wish to include partially received line items in your close. Enter the percent of items that must be received before the close function will consider them for closing. Entering zero will indicate that you want the percentage to be 100%. This field will be skipped if the above field is N.
Answer Y if you wish to print a report of the results based on your selections. Enter a valid vendor number of the first vendor whose purchase orders are to be included among those that are to be closed. Enter a valid vendor number of the last vendor whose purchase orders are to be included among those that are to be closed. Enter the earliest purchase order date that will qualify the PO to be included among those considered to be closed. Enter the latest purchase order date that will qualify a PO to be included among those considered to be closed. Enter a valid buyer code that must appear on the purchase orders that are to be included among those that are to be closed. Press F7 to search by Buyer Code. Answer Y if you wish to include partially invoiced purchase orders in your close. Answer Y if you wish to include partially received purchase orders in your close. Answer Y if you wish to include the purchase order line items on the report. This does not have any effect on the selection criteria.